Now that the experimental cap seems to be holding on BP’s blown-out well in the Gulf, it’s time to step back and take a wider view of the company and the industry it occupies. While we need to keep the focus on BP and its shortcomings – as well as the guilt of other actors, including subcontractors, regulators, financial analysts, NGOs, and a public addicted to fossil fuels – it’s worth thinking about what we expect not just of companies, but of business industries and sectors. The trend toward mandatory disclosure of environmental, social, and governance (ESG) risks might help prevent a repetition of BP’s horrible actions – but we’re not there yet. In the meanwhile, we can take positive steps to develop industry-wide ESG standards, and methods of implementing them. A new white paper from the Initiative for Responsible Investment (IRI), based at Harvard Kennedy School’s Hauser Center for Nonprofit Organizations, and Arup, a powerhouse environmental consulting firm, makes the case for industry-based sustainability reporting. In From Transparency to Performance: Industry-Based Sustainability Reporting on Key Issues, authors Steve Lydenberg (Chief Investment Officer of Domini Social Investments), Jean Rogers (Principal of Arup) and David Wood (Director of IRI) propose a six-step method for identifying key performance indicators (KPIs) on the social and environmental impacts of US corporations. Create a tailored set of key performance indicators for the most material issues for each sector. These KPIs should be rooted in three core principles: simplicity, materiality, and transparency. Nowadays, with more than 3,000 companies voluntarily issuing sustainability reports and recent efforts promoting issuance of “One Report” to integrate financial and non-financial metrics, mandatory reporting is gaining traction. In 2009, the GRI issued its Amsterdam Declaration calling upon the world’s governments to make sustainability reporting mandatory, following the lead of France and Sweden. Meanwhile, in the U.S., in January 2010 the SEC released what many consider landmark guidance on corporate disclosure related to climate change. Lydenberg, Rogers, and Wood acknowledge the progress made in expanding corporate reporting to include ESG data. 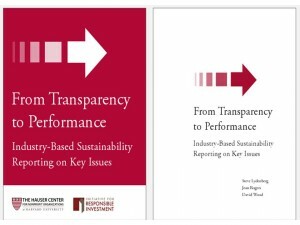 They also note the fact that these reports “go by a variety of names, including sustainability, ESG, corporate social responsibility, triple bottom-line, corporate citizenship, and environmental health and safety reporting.” And, they argue that sustainability reporting should, “to some extent”, be made mandatory “in order to assure that comparable sustainability data is available” as well as helping assure “capital markets create long-term wealth and sustainability for shareholders and society alike.” Their report includes a rationale for a mandatory regime – they believe “key performance indicators play a vital role in any sustainable disclosure scheme” – as well as alternative forms. This entry was posted in Corporate Reporting and tagged Amsterdam Declaration, Arup, benchmark, Bob Massie, Domini Social Investments, ESG, G3, GRI, industry, Initiative for Responsible Investment, key performance indicators, KPI, Lydenberg, mandatory disclosure, materiality, National Annexes, One Report, Rogers, SEC, sector, shareholders, sustainability, The Transition Group, Wood. Bookmark the permalink. Thanks for this, Marcy. The paper was meant to contribute to discussion, and I agree that there are risks to taking only an industry sector approach — one of the things we tried to balance was a commitment to a shared universe with a KPI floor that varied according to sector. Then there’s the problem that the sectors themselves don’t necessarily capture corporations…. You’re most welcome, David. It’s a terrific contribution, and serves as a reminder that there are many interdependencies, that companies are not untethered (even though many act that way) from a socio-political and economic context. What I find fascinating about this conversation is that it gets people thinking about primary values animating organizational governance and operations, and how these values are translated into concrete objectives and measures that serve as yardsticks to measure progress. Often missing from these, however, is a process for moving forward, one that features collaborative engagement and learning, so that adjustments can be made and local concerns and circumstances taken into consideration. We look forward to future coverage of this, and other important work at IRI. First of all, Marcy, thank you very much for the in-depth and insightful review. We very much appreciate your thoughtful attention and it is exactly this sort of dialogue we hoped would ensue. To touch on a comment that Bob made- we hoped this method of mapping the materiality of issues by sector would advance (not undermine) the core purpose of ESG reporting- to compare performance across (and within) sectors. While Bob rightly notes that all companies regardless of business model follow GAAP, as we know, environmental and social impacts vary from sector to sector, as do the appropriate units of measure. Community impacts for airlines are measured differently than community impacts for mining, for example. By developing this method, we hoped to find a sweet spot between reporting on a broad range of general sustainability issues that are comparable but not necessarily material, and each company determining their own specific issues for reporting, which are material but not necessarily comparable. Our premise when we started the mapping project was that certain issues could at a minimum be measured and compared within sectors- however, what we found was a pleasant surprise- there are material issues that also cross sectors. page 29 of our report presents a snapshot of the relative materiality of issues by sector. Some, like climate change management and impacts on communities, show a high materiality score for all of the sectors we studied. Other issues were more unique. Each sector has a different profile of material issues precisely because the activities and business models are so different- and understanding the relative materiality of these issues helps companies to understand the risks and opportunities presented by sustainability challenges- and helps policy makers to understand which issues cross sectors and where to focus attention. While it is important to consider the broad universe of ESG issues such as those presented by GRI in determining KPIs, it is not necessarily important or desirable to mandate reporting on all the issues if the impacts are not material to stakeholders. By the same token, obtaining a comparable set of ESG data is too important to leave it to companies to figure out what to report. We argue that a comparable set of ESG data, which is nirvana, can be attained faster by defining up front those issues and indicators that are most material for each sector, and providing that guidance as a basis for minimum reporting. All this is to ensure that reporters see a benefit to mandatory reporting as well– more companies will be encouraged by the relevance and insight that ESG reporting can present- as long as they are focused on what is material and comparable, rather than reporting on everything under the sustainability sun, or conversely, only what is unique to their situation. There are a few important criteria that I think are essential if socially responsible indicators are to be useful. 1. They must be comparable over time, defining relative improvement of an entity. 2. They must be comparable between entities. 3. They must be scalable, applicable to entities at all sizes and scales of marketplaces. The recommendations in the paper, were primarily elaborations of the GRI reporting guidelines, which do not provide for comparability between entities, and even strained comparability over time. As strained as financial reporting in the modern world is, GAAP does provide some comparability over time, between entities, and between entities of varying scales. Net income is net income for a publicly traded company with billions in revenues, or for a private one with only thousands of revenues. A CRITICAL omission that I observed was the absence of regionalism as a desired characteristic. The combination of characteristics recommended are then useful then for only public traded (or comparable scale) companies and limited range of criteria for shareholders. Sustainability metrics should similarly be applicable to entities of all sizes, and metrics should not favor one type or scale of entity over another. The purpose of the metrics is not solely for the socially responsible investing community, but for multiple purposes. hi, great post, Marcy, clear and useful overview, thank you. I have glanced at the IRI report but not yet studied in detail. However, I will add that the issue of materiality continues to evade the best of corporations in both their practices and in their reporting. Some material issues are generic, some are sector-specific, some location-specific and some will be company-specific. What is critical in the development of materiality is an understanding of context in which each unique company operates, and extensive structured stakeholder feedback which should bring the most important issues to the fore. Intuitively, I believe some sector standardization for material issues is advantageous, though I am not sure how easily all can fit into this framework, and just as the GRI’s objective of comparability was never really achieved, what I have seen of the KPI’s proposed in the IRI paper also leave some room for interpretation and contextual shading. Perhaps true comparability is non-achievable and the best we can hope for is a more accurate assessment of what I call the Net Sustainability Gain of any corporation, as measured in context of key externalities and against its own progress and commitments.